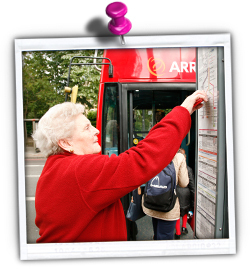 All 8000 London buses are accessible to all Disabled and older people. The only restriction is for travellers using a very large electric wheelchair or large mobility scooter (see below). Assistance dogs are welcome on all buses and may travel upstairs or downstairs. Audio-visual announcements are available on all London buses informing passengers about destinations and issues. If the system does not seem to be working, speak to the driver. Priority seats: There are priority seats on the lower deck for people who find it difficult to stand. Don’t hesitate to ask passengers to give you their seat if you need it. Don’t forget that TfL has issued a “Please offer me a seat” badge for people with an invisible impairment. Contact our helpline for more information. A Travel Support card is also available for people who need a bit more support from the driver. This can be very useful for people with dementia, people with speech impairments and people with learning difficulties. Click here for more information. Buses can also kneel to help you get on-board. Mobility walkers and shopping trolleys are welcome on-board and you can ask the driver to lower the ramp or kneel the bus if needed. Ramp: Buses usually have a ramp at the middle doors (wheelchair and mobility scooter users board via these doors). Some single-decker buses have a ramp at the front doors. Wheelchair priority space: On each bus, there is at least one space in which wheelchair and mobility scooter users have priority over other passengers: the dimensions of the wheelchair priority space vary, but it should be big enough for wheelchairs with the following dimensions: 1200mm long and 700mm. There is often conflict over who has priority to use this space. Wheelchair and mobility scooter users have priority: see below for more information. Dimensions: You can use your mobility scooter on buses if it is a class 2 mobility scooter and it has the following dimensions: maximum width is 600mm; maximum length is 1000mm; maximum turning radius is 1200mm. If your mobility scooter is smaller than those dimensions you should be allowed on board, but to avoid any uncertainty, it may be better to apply for the Mobility Aid Recognition Scheme. 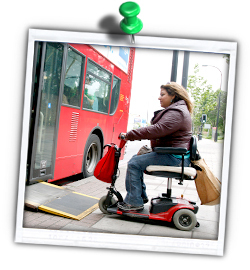 The Mobility Aid Recognition Scheme can provide a card to owners of scooters that TfL have approved for travel on buses. This will prove to the bus driver that your mobility scooter is allowed on board. To apply, contact TfL’s Travel Mentoring Service on 020 3054 4361. If you experience any problems with drivers not permitting you to travel, please contact us (click here for our contact details). Transport for All is fighting for these changes. But we need your help. 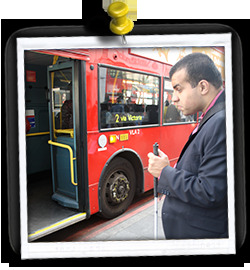 Wheelchair users, mobility scooter users as well as visually impaired people using a guide dog, are entitled to free travel on London buses and do not need to show any ticket or pass. Personal assistants or carers must hold a valid ticket/Oyster card or bus pass. Transport for All is campaigning so that discounts and concessions are also made available to personal assistants and carers: click here to help us achieving this goal. There are various different timetables and maps available online, for a printed version please ring Transport for London (see below for contact details). You can also plan your bus journey using the TfL journey planner (click here to use it). This journey planner is very useful despite not being perfect. If you use a mobile phone there are quite a few applications out there to help you plan your journey such as Citymapper. You can also use Google Maps. TfL Journey Planner is not available via an app but you can still use it on your mobile phone. Please note that all those apps needs internet access to give you live/updated information. There are Countdown signs at 2,500 bus stops that show which buses are coming and when they will arrive. There are also apps available giving you live information on when your bus will arrive. …for travellers using a mobility walker or a shopper trolley: If you use a wheeled mobility walker or a shopper trolley, don’t be too shy to ask the driver to lower the bus or the ramp so you can board more easily. The bus has been designed to do this and the drivers have been trained to operate this function when requested – they only have to push a button. Who gets priority over the wheelchair priority space? Wheelchair users, mobility scooter and disabled children using a buggy as a mobility aid are to be given priority on all buses. If the space is occupied by other passengers or buggies, the driver must us the iBus automated announcement stating “A customer needs the wheelchair priority area. Please make space“. If the customer does not move, a second message should be played: “Customers are required to make space for a wheelchair user. This bus will wait while this happens“. The bus driver can’t force someone to move but should actively require that the space is vacated for you. If this doesn’t happen, please contact us; we need to complain about it! Getting off the bus: There is a blue button for wheelchair and mobility scooter users to ask for the ramp to be deployed at the next stop. This will send a signal to the driver that they need to lower the ramp at the next stop. Once again, they will have to let passengers get off first, then close the doors to deploy the ramp and finally let you get out. As a traveller you have some rights and can expect certain standards when travelling. Your rights mainly come from two places: the Equality Act and the Big Red Book. The Big Red Book is a guide explaining to drivers the rules they need to follow. Here are some of the standards you should expect while travelling on buses. If something goes wrong please contact us! No London bus should leave the garage with a faulty ramp. The driver should stop and deploy the ramp when the blue button is pressed. The driver is only allowed to refuse entry to any dog if it is behaving aggressively. Guide/assistance dog owner can use the seats by the wheelchair priority area so the assistance dog can sit in it. If needed the bus driver should ask people already occupying the area to share the space. The bus driver should extend the ramp or kneel the bus, if a passenger with a mobility walker or shopping trolley asks for it. Audio-visual announcements should be turned on. Bus drivers should pull over very close to the kerb and bus stop. They should allow you enough time to get seated before pulling away from the bus stop. Wheelchair users, mobility scooter and disabled children using a buggy as a mobility aid are to be given priority on all buses. The bus driver can’t force someone to move but should actively require that the space is vacated for you. If this doesn’t happen, please contact us; we need to complain about it! Passengers using a class 2 mobility scooter (maximum width is 600mm; maximum length is 1000mm; maximum turning radius is 1200mm) should not be refused access to buses. Bus drivers should always make sure that passengers who want their bus have an opportunity to board before they pull away: this means that they need to pull up to the bus stop’s flag-post if needed. We need to report it or complain about it. Every time we report a problem, it helps build the case for a more inclusive and reliable transport system. Posted by Mr. Bloggy on 30/10/2018 in Care of the Elderly, Disability Access, Know Your Rights, London, London Buses, Motability Scheme, News, TfL, Transport for London and tagged Disability Access, Know Your Rights, London Buses, TfL.